Ana’s microloan story reveals how $100 helps restock supplies. Ana is 57 years old and resides in Delusom, Leon B. Postigo. She is married and blessed with only one child of adult age. Ana joined Paglaum Multi-Purpose Cooperative (PMPC) in 2008 in order to access the programs and services of the coop. 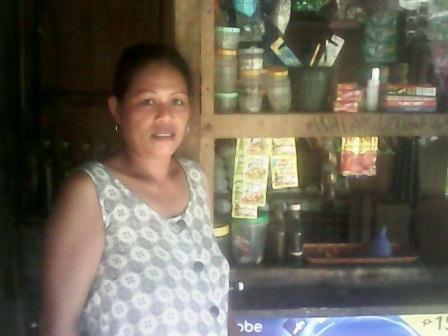 Recently, she has accessed her 11th loan for the amount of 4,000 PHP. Ana’s microloan story shows how the additional working capital allows her to restock her store with items such as canned goods, oil and soy sauce. In Ana’s native country of the Philippines, the average annual income is only $7,000. So, this microloan of $100 can go a long way towards helping her restock her inventory for her food selling business. Dr. Joe Johnson and Kiva.org provide loans such as this one for entrepreneurs like Ana, in order to help them grow their businesses. There are many ambitious, enthusiastic entrepreneurs all over the world. However, many of them live in areas where it is difficult to get access to capital investments. Providing capital through Kiva.org can help entrepreneurs like Ana grow their businesses and help them to create economic stability for their futures. The goal is not to give handouts simply as charity, but rather to give loans that help to fulfill specific business needs. Ana requested 100 for stocking her inventory, and that is exactly what she got. Now she can use it to help her grow her business. The field partner for this microloan is Paglaum Multi-Purpose Cooperative (PMPC). PMPC was founded in 1992 by the beneficiaries, parents and staff of the Paglaum Community Development Foundation to address economic and livelihood activities for sustainability. The organization operates in the northwestern provinces of Mindanao and Visayas. In the local vernacular, “paglaum” means “hope”. The initial foundation is dedicated to child development through a holistic approach. The goal is to build self-reliance and expand opportunity so the poorest of the poor can help themselves. oil, and soy sauce in the Philippines. However, there are countless other entrepreneurs who are underserved, and could greatly use capital. If you are interested in making a loan to one of these entrepreneurs, please feel free to visit Kiva.org today!